When I first wrote about the inflatable pub rental service out of Boston, it seemed like having a blow-up bar for a party or family reunion would suffice. But as my colleagues and I ruminated on the idea of being able to easily produce an entire booze-centric building whenever and wherever we pleased, one word kept being repeated, “want.” Luckily, The Inflatable Pub Company of Ireland is here to satisfy that desire. The Inflatable Pub Company currently rents and sells a few models, from the largest—70 person capacity structures called The Saloon and The Mac— to the smallest—The Matt Malloy and The Tavern which hold a more intimate 30 patrons. They feature details like faux leaded glass windows, wood and stonework, tile roofs, personalized signage and even fireplaces. (No dartboards though, which is probably for the best.) . And don’t tell anyone I told you, but fans of “The Simpsons” could be seeing a Moe’s Tavern model in the near future. McMahon Winters says negotiations are underway, and she’s optimistic a deal might be reached. The prices range from $2500 to $6200 and orders take about 3-4 weeks to fulfill. Something tells me it’s a little faster and easier than trying to construct your own building from scratch. McMahon Winters also tells me there’s a huge market for the inflatable pubs in Ireland and the UK, where they’re popular at weddings and backyard parties. Some people have even built a “village” of multiple inflatable buildings for outdoor receptions. They’ve also proven popular at large music and arts festivals around Europe. And on this side of the pond the inflatable pubs have taken off in places like New Jersey, Long Island and Massachusetts where a large Irish-American population lives, as well as places like Arizona and Florida where the Irish community may not have access to historical haunts like they do in America’s older cities. A former New York City resident herself, McMahon Winters says no matter where she goes people always want to talk to the inflatable pub lady. She’s even shipped pubs as far as Dubai. Frankly, if I didn’t live in an apartment I’d probably be saving my pennies for one of these things as we speak. Until then I’ll just have to hope the couple at the next wedding I go to has the good sense to go inflatable. 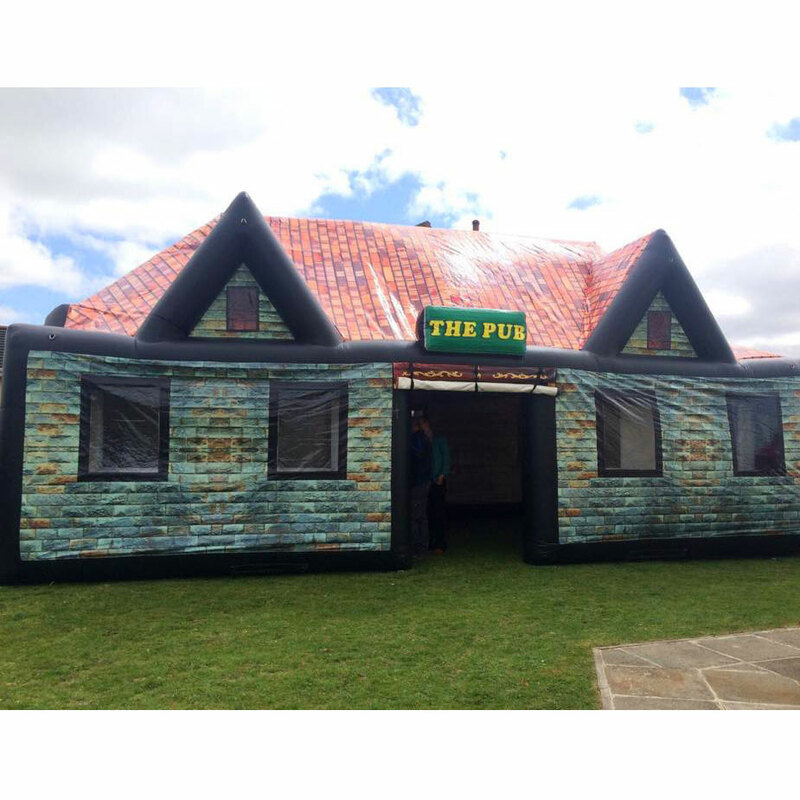 Update: Inflatable pub rentals are now available across the U.S., find out more here.